Eric Kerns and Orion Howard have teamed up with brewer Chris Post on the MASS MoCA campus. Photo courtesy of Eric Kerns. New breweries tend to pop up in unlikely industrial spaces, and Bright Ideas Brewing in North Adams is no different. The small but ambitious operation is a new tenant of MASS MoCA, which means that finding the front door to the brewery involves some poking around in the art museum’s front courtyard. After a minute or two, you spot it: the bright orange, all-caps lettering jumps out from the window above a set of glass doors in an enormous brick exterior. If the entryway to Bright Ideas seems dwarfed by the echoing factory setting, the taproom inside paints a different picture: big windows, warm light, a long wooden bar top, and eye-catching walls in primary colors. On the Saturday I stopped by in early May (about a month before the official grand opening), the place was busy with a few dozen visitors chatting, eating food cart lunches, and sampling flights of craft ale. North Adams is not without its leisure-hour gathering places like this — Public Eat + Drink serves craft cocktails and hosts live music, while pubs and diners like The Hub turn out some great lunches. And, of course, MASS MoCA’s 17-year run in this city has boosted and transformed tourism and residential life. But there’s nothing downtown quite like Bright Ideas, and in North Adams — the least populous city in Massachusetts, with just 14,000 residents — each new swell of economic activity is something special. For decades, Sprague Electric Company was the city’s largest employer. After Sprague downsized and moved out of town in the mid ’80s and the early ’90s, times have been tough here. But things are turning around. Old factory spaces are becoming low-cost lofts for artists. There is more robust discussion lately of forming maker spaces and supporting local artisans and small businesses. And MASS MoCA — which resides in the converted factory complex that Sprague so abruptly vacated — wants to capitalize on this new era of simmering start-ups by attracting more retail tenants, and foot traffic, to the museum’s front courtyard and surrounding buildings. Enter Eric Kerns and Orion Howard, the co-founders of Bright Ideas. They pitched the brewery to MASS MoCA, Howard explains, after the two friends drew a five-mile radius around North Adams and counted up breweries with taprooms. It didn’t take long. Aside from some casual homebrewing years ago, neither Howard nor Kerns make beer — Howard is a practicing oncologist, and Kerns works mainly in marketing, development and hospitality. So they recruited Chris Post, the mastermind behind the small craft brewery Wandering Star in Pittsfield, to be their head brewer. The bright idea was simple: make well-balanced and flavor-forward beers that are, above all, refreshing and drinkable. Steer clear of esoteric labels: simple names like Bright Ale, Bright IPA, and Bright Wheat will suffice. Don’t worry about the brew being flawless on the first run. Get a few styles on tap, open the doors, and see what happens. As the old adage goes: done is better than perfect. 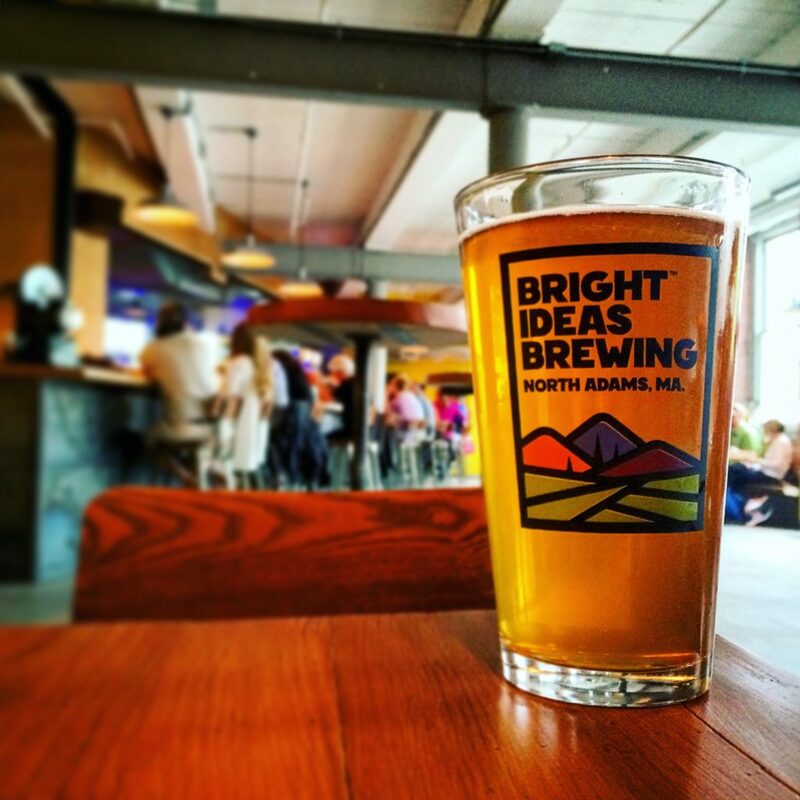 For the first several weeks, every beer Bright Ideas has poured in the taproom has been a live-fire experiment, with no trial runs (it helps that Post was able to adapt and build off his great recipes for Wandering Star). And for those visitors expecting to be wowed by a style they’ve never tried before: take it easy. More varieties are on the way, but the eight styles I tried on my visit were fresh, simple, and straightforward. IPA lovers accustomed to aggressively hop-bursted beers from Dogfish Head, Sierra Nevada, and Stone may find the Bright IPA rather understated, and the workmanlike Ale, Brown, and Red are, for better or worse, uncomplicated. The ESB, a classic British pub bitter style, is equally solid. The Wheat ale carries the rich, unfiltered smack of lemongrass and blood orange citrus, but overall, nothing here will shock your tastebuds. The two most assertive and memorable varieties available right now are the Stout, which is deliciously accented with espresso and chocolate, and the Gose, Post’s first-ever sour beer. You’d never guess the head brewer was flying blind on this one, because it’s a wonderfully tart and refreshing accomplishment. Bright Ideas has distributed a few kegs for events, but larger plans for draft distribution outside the brewery are still in the works. 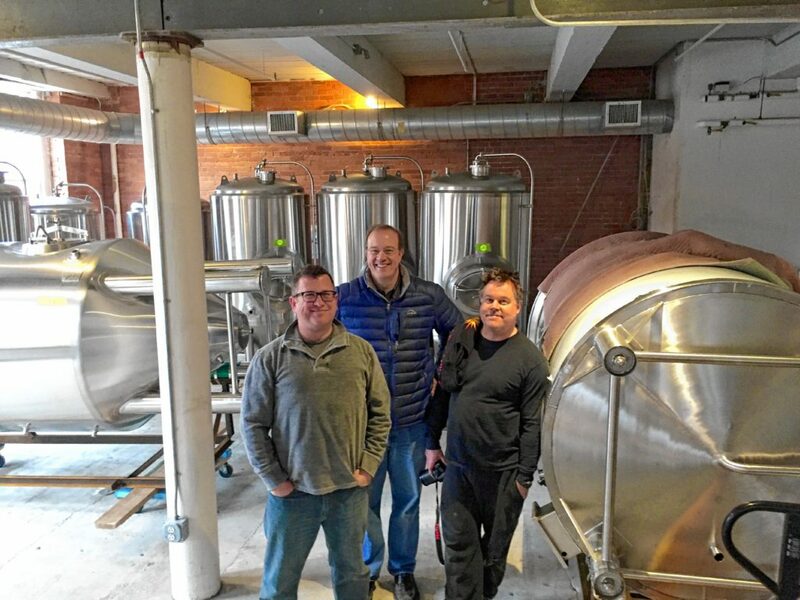 Before too long, Howard and Kerns hope to produce enough of the flagship Ale to sell to area bars and restaurants at the price point those businesses are currently paying to serve Budweiser and Coors. If Bright Ideas can pull that off, it will allow those local beer spots to sell beer brewed in North Adams for the same $3 per pint that a customer might typically spend on a Bud Light.